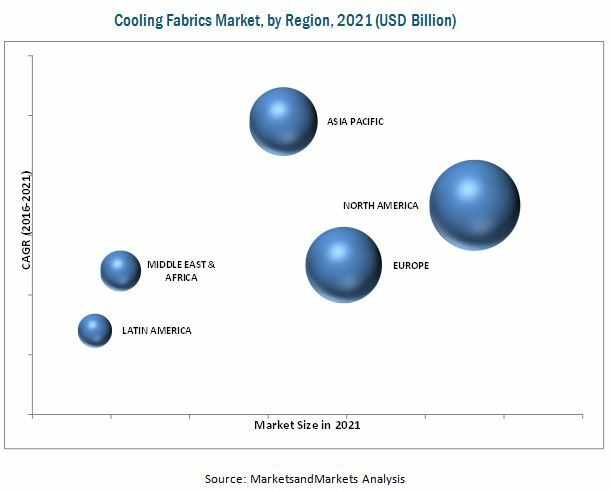 [156 Pages Report] The Cooling Fabrics Market was valued at USD 1.80 Billion in 2016 and is projected to reach USD 2.94 Billion by 2021, at a CAGR of 10.3% from 2016 to 2021. For company profiles, 2015 has been considered as the base year. In cases wherein information was unavailable for the base year, the years prior to it have been considered. The cooling fabrics ecosystem includes raw material and cooling fabrics manufacturers, such as Shell Chemicals (U.S.), Coolcore LLC (U.S.), Ventex Inc. (Korea), Polartec LLC (U.S.), Nan Ya Plastics (Taiwan), Nike (U.S.), Adidas (Germany), The North Face (U.S.), and Ahlstrom (Finland) among others to strengthen their position in the cooling fabrics market. The products manufactured by these companies are used by sports apparel, protective clothing, lifestyle, and other related companies. 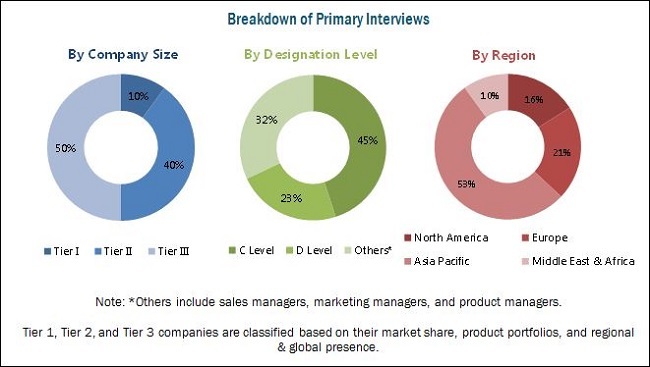 Scope of the report: This research report categorizes the Cooling Fabrics market based on type, application, and region. The report forecasts revenues as well as analyzes the trends in each of these submarkets. The cooling fabrics market was valued at USD 1.80 Billion in 2016 and is projected to reach USD 2.94 Billion by 2021, at a CAGR of 10.3% from 2016 to 2021. The growth of the cooling fabrics market is mainly attributed to the growing demand from sportswear and protective wearing market applications. Major applications in the cooling fabrics market include sports apparel, protective wearing, lifestyle, and others. The sports apparel application dominated the global cooling fabrics market due to the growing sportswear market and the increase in sports and leisure related activities across the world. These factors are also anticipated to drive the cooling fabrics market for sports apparel application in the coming years. The cooling fabrics market has grown considerably in recent years due to the demand from sports & leisure activities sector, changes in lifestyle, and growing concerns for health and wellness. Based on type, the cooling fabrics market has been segmented into synthetic and natural. The cooling fabrics market was dominated by the synthetic segment due to its increasing demand and usage in across varied industries as these fabrics have more durability than natural cooling fabrics. Easy availability of raw materials used for manufacturing synthetic cooling fabrics is another factor driving the growth of this segment. Innovations in the textile industry and demand for garments that provide long lasting cooling effect are leading to an increase in the demand for synthetic cooling fabrics. The North American region led the cooling fabrics market in 2016 due to the increased demand from defense and sports apparel applications. Development of manufacturing processes and increasing investments to reduce product cost are the major drivers for the North American cooling fabrics market. The U.S. is among the fastest-growing markets for cooling fabrics in the North American region due to the growth in defense budgets and growing end-use application markets, such as sportswear and medical. The major restraints for the cooling fabrics market are the high manufacturing cost of cooling fabrics, low market penetration, and lack of awareness among end users. Key companies, such as Ventex (Korea), Nan Ya Plastics (Taiwan), Tex-Ray Industrial Co. Ltd. (Taiwan), Invista (U.S.), Ahlstrom (Finland), Formosa Taffeta Co. Ltd. (Taiwan), Singtex (Taiwan), and Coolcore LLC (U.S.), among others are operating in the cooling fabrics market. These players, with a wide market reach and established distribution network, are investing more in research & development activities. They also have strong technical and market development capabilities, which enable them to upgrade their existing products for new applications. 12.7 Tex-Ray Industrial Co., Ltd.